are getting poorer. Cartoon courtesy of AM 1600 WWRL. Economist, Emmanuel Saez of the University of California at Berkeley, crunched the numbers for the two years coming out of the financial meltdown, starting in 2009, and came up with the jaw-dropping finding that the wealthiest 1 percent of Americans had captured 121 percent the nation's gains in income. Income for the remaining 99 percent actually declined further over those same two years. In other words, "we" have moved out of the recession only if we consider "we" to be the top 1% of the wealthiest Americans. Meanwhile, high unemployment rates are keeping wages suppressed for the rest of us. The other headlines in the business section seemed to support this unpleasant reality: Study: Philly leads nation in 'deep-poverty' residents, Low-wage workers gloomy about future, College educated dishwashers, Survey: Low-wage workers missing out on training. Kind of a depressing series of articles to stumble upon in the morning, although I am trying to see it as a positive development that this issue is being addressed in the mainstream media. Another morning ritual of mine is to peruse the Recycled Minds Twitter feed, where I always come across interesting articles and valuable insight. Today, I found a link to a graphic from the National Low Income Housing Coalition on minimum wage and rent. 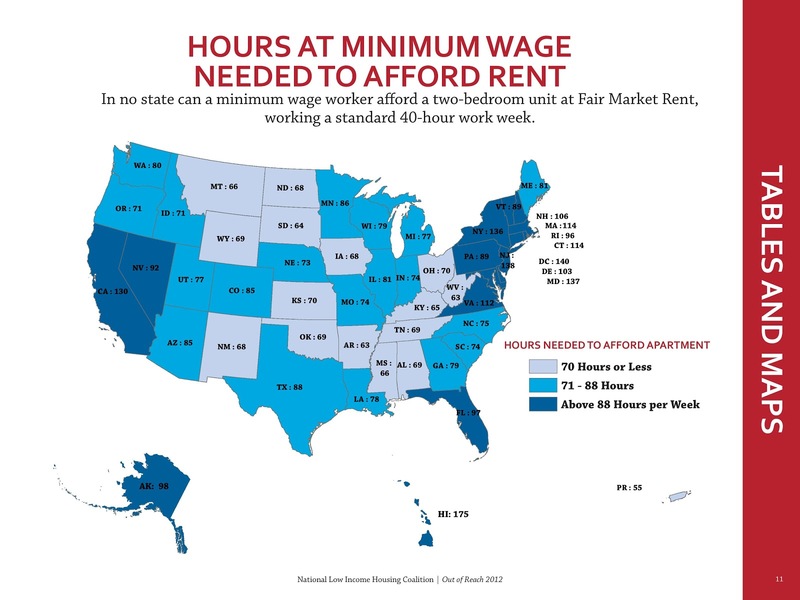 The graphic shows, by state, how many hours someone would have to work per week at minimum wage to be able to afford a two-bedroom apartment or house at fair market prices. Nowhere in the country can someone work a 40-hour work week on minimum wage and find themselves able to pay rent on two-bedroom housing. The top five states (or is it the bottom 5?) in which to work at minimum wage, if you need to afford a two-bedroom home, are Arkansas and West Virginia (63 hours/week), South Dakota (64 hours/week) Kentucky (65 hours/week), and Mississippi and Montana (66 hours/week). The top five worst states for minimum wage earners are Hawaii (175 hours/week), Washington DC (140 hours/week), New Jersey (138 hours/week), Maryland (137 hours/week), and New York (136 hours/week). In 17 states (33%), you would need to work 88 hours/week or more, and in 19 states (37%), you would need to work from 71-88 hours/week to afford your 2-bedroom abode. Keep in mind that a week is 168 hours. In a country that champions the imposition of the 40-hour work week, we have made it nearly impossible for millions of minimum-wage earners to house themselves and their families. In Hawaii, there literally aren't enough hours in the week for a minimum wage earner to afford that 2-bedroom home. In a full one-third of US states, you would have to work more than 12 hours per day everyday just to cover rent. According to the Bureau of Labor Statistics, "in 2011, 73.9 million American workers age 16 and over were paid at hourly rates, representing 59.1 percent of all wage and salary workers. Among those paid by the hour, 1.7 million earned exactly the prevailing Federal minimum wage of $7.25 per hour. 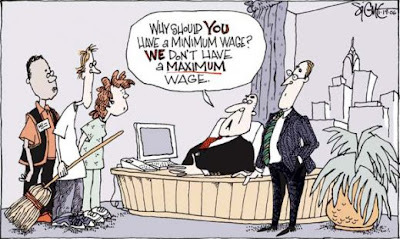 About 2.2 million had wages below the minimum." And yet, the rich keep getting richer, as the bottom 99% of the US population continues to see their wages fall. Class issues are alive and well in the US, and people are starting to recognize them. Occupy has been on this for years now, but it's funny how this message is suddenly acceptable for the front page. Makes you wonder about the imposition of the institution of marriage too - what with tax credits and other deductions. But still, even at these rates, a two-person household would not be able to afford a two-bedroom rent at minimum wage. It's scary. Depois da visita ao teu blogue... só tenho que te felicitar pelo o que aqui vi! Convido-te a visitares o meu blogue. This stuff makes me think. The housing issue is very big deal for not rich people and to those who cannot afford. To incorporate higher minimum wages, American CEOs would cut entry level employees, before cutting their salary and monthly bonuses.